Upcoming Producer Elofiz Presents Roll Up : Featuring AVL's B-Ice ( from the critically acclaimed UCANTBICE Mixtape, kiss n tell ft mohits k-switch), Gidis very own Mr.Walz (Weyreypke, mo like e prod.by jay sleek & checkmate), the up and coming ecclectic LSMK(Zombie.Hennessy) and Chocolate City's First Lady ; Pryse!. 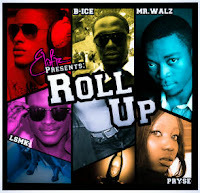 Elofiz being the pioneer and engine for this dolled out track, B-ice carries the first verse, Mr.Walz delivers the hook and second verse, LSMK breaks it down at the bridge and Pryse seals the deal of a track!. Nothing short of a Banger here people!